We woke up the following morning to a light dusting of icy snow. Super exciting for this Florida girl! Our plan for the day was to walk the town and then head up the mountain to Ten Thousand Waves Spa for some relaxation and dinner. The Georgia O’Keeffe museum was a couple blocks away so we started there and let the day take us. Although I was familiar with Georgia’s iconic floral paintings, I knew little of her background and process. I fell in love with her city scenes, abstracts, and landscapes. It was interesting to see how she approached her studies for future paintings. They were so minimalist in every sense of the term. It was amazing to me she could create full works of art with a few lines and a couple of notes. I left the museum feeling inspired by and more informed about this iconic woman. 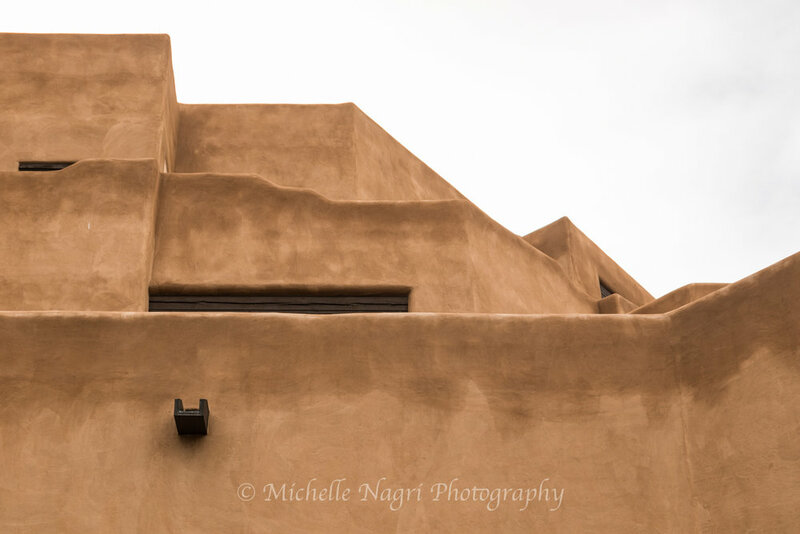 We ventured back to the streets of Santa Fe where I was once again captivated by the architecture of this charming city. The day was cloudy and overcast. No direct sunlight to create the characteristic contrast of light. 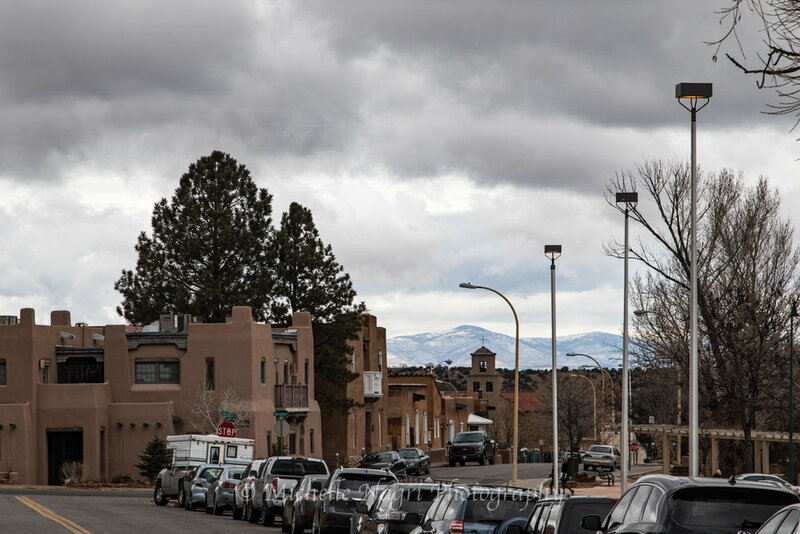 We made it as far as the Santa Fe Railyard, which is an up-and-coming area with some amazing galleries (a few of which we visited), eateries, and farmer’s markets. As we made our way back to the casita some blue skies started to peek out from behind the clouds, which made for a nice ending to an overall gloomy day. The drive up the Sangre de Cristo Mountains to the spa did not disappoint as we were finally treated to nice blue skies mixed with puffy white clouds. We, of course, had to pull over as many chances as we could to shoot and sketch. When we arrived at the spa I felt as though we had been transported to Japan. We had 60ft of steps to climb from the parking lot to the entrance, which was a little daunting with the melting snow. However, the view was beautiful, the hot tub relaxing, and the shiatsu massage was on point. We concluded our spa visit with a refreshing meal and hot tea at their Japanese restaurant. By this point it was dark, so we took a shuttle down to our car and made our way back to the casita. Day 2 was filled with many sights and sounds, and lots of new information. We were still adjusting to the altitude and I found myself needing rest and water more than I was used to. Despite the physical adjustments I was deeply moved by the architecture, mountains, and trees, especially the trees. I fell in love with the cottonwood trees, captivated by their texture, and the stark white aspens with their slender charm. The cottonwoods have gnarly bark and twisting branches. There is something solid and immense about them. At this time of year they had very few small gold leaves. I wanted to touch each tree I saw and learn all its secrets. The grooves of the bark were deep and captivating. In contrast, the aspens are bright white and smooth by comparison. Hardly any depth, but just as elegant as the cottonwoods. They were hosting golden leaves this time of year too. 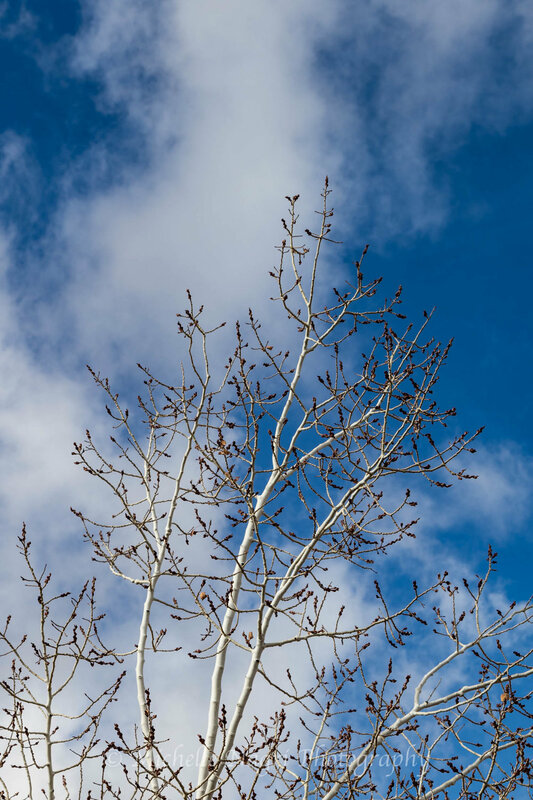 I especially loved the aspens against blue skies. It was great to take in the architecture during the day. Although I would have liked more sunlight, I made do with what I had. It allowed me to capture the shapes of the buildings as though they were two-dimensional objects to be arranged on a canvas. The city itself was delightful to walk through. There is so much to see, so much history, and so many galleries. We hadn’t even touched Canyon Rd at this point, the half-mile stretch of road that houses over 80 different art galleries. I wanted to capture the essence of the city itself, with its winding roads and glorious vistas. As the day wore on the sun finally made an appearance giving the buildings an orange glow, and a delightful contrast to the blue skies. I returned to the First Presbyterian Church from the prior night to see how the daylight would change its appearance. I was equally fascinated with that same door and light, but this time I added a cluster of aspens for some contrast. The drive up the Sangre de Cristo mountains to the spa was incredible. The sky was doing wonderful things between larger than life clouds and that late afternoon blue. We pulled over several times as we made our ascent. I love the softness of the mountains and the light dusting of snow on the higher altitude portions. All in all it was a good day, and though we were dead tired by the end of it we had enjoyed so many wonderful sights and sounds and tastes, combined they made the exhaustion so worth it. 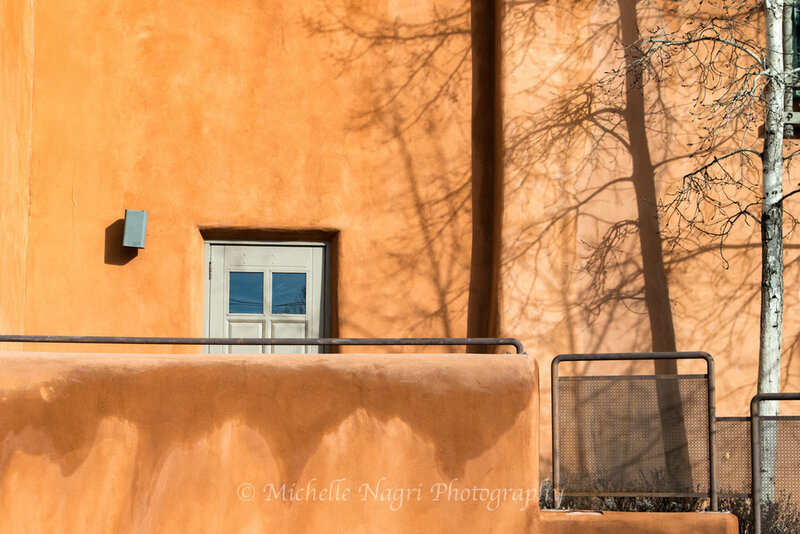 I hope you enjoyed the sights and story of Santa Fe day 2. For day 3 we venture to Tent Rock Mountains. If you liked what you read and enjoyed the photography please consider buying me a cup of coffee for $3 by using the support me on ko-fi button at the bottom of this post. Your contribution helps keep this train moving. I always welcome any feedback or questions you may have and can’t wait to share the next installment with you! Thank you for your support!